A rather low-key end to the year with the arrival of breezier and milder conditions restricting interest to a modest selection of the regulars. Two Great Skuas lingered off the Bill for a while where 6 Red-throated Divers and 4 Common Scoter passed through, 3 Purple Sandpipers and 2 Blackcaps remained at the Bill where better coverage of the East Cliffs resulted in a total of 4 Black Redstarts making the log, the Eider and Black Guillemot were still off Portland Castle and 16 Black-necked Grebes were again off Sandsfoot Castle. A more of the same day, with 2 Fieldfares and a Lapwing at the Bill and another Fieldfare at Portland Castle were the only obvious signs of a response to the continuing overnight frosts. Routine list-padders at the Bill included 13 Red-throated Divers through on the sea and 4 Purple Sandpipers, 2 Blackcaps and a Chiffchaff still about on the land, 3 Chiffchaffs and a Goldcrest were at Portland Castle, whilst the day's Portland Harbour assortment included 16 Black-necked Grebes, 5 Great Northern Divers, 4 Eiders, 2 Slavonian Grebes and the Black Guillemot. Another icy dawn gave way to a beautiful day of unbroken sunshine. 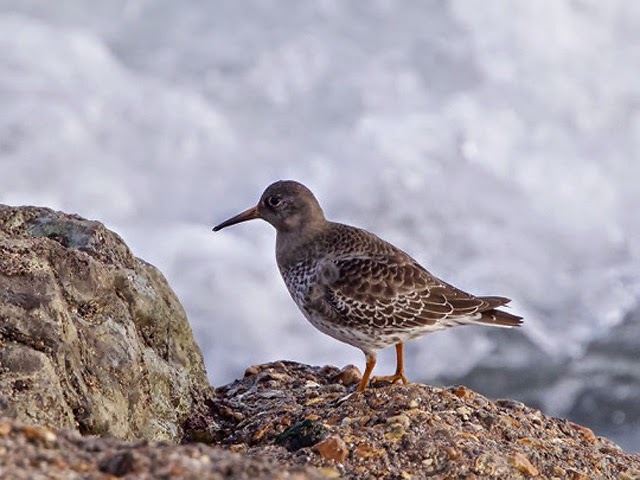 A few more new arrivals put in appearances, notable amongst which were 2 Velvet Scoters in Portland Harbour; the first Chiffchaff at the Obs for several weeks, 7 Brent Geese and a Shelduck through off Chesil Cove and the Bill respectively and 2 Wigeon in Portland Harbour were all likely to be responding to the chilly conditions, as were 2 Fieldfares amongst totals of 50 each of Blackbird and Song Thrush, and 2 Redwings around the centre and south of the island. Standard mid-winter fare included at least 1 of the Blackcaps still at the Obs, 15 Red-throated Divers through off the Bill where a Great Skua lingered, a Black Redstart at Chesil Cove and the Black Guillemot and Eider off Portland Castle. We might have lost the star attraction but there was still a good deal of interest at a more local level, with the chilliest night of the winter to date (...and probably even of the year as a whole) prompting signs of limited cold weather movement. Singles of Grey Heron, Redwing and Fieldfare headed north over the Bill, where 2 Black-headed Gulls were about the fields and 27 Wigeon, 21 Red-throated Divers, 7 Brent Geese and an Eider passed through on the sea. Long-stayers still about included 2 Blackcaps at the Obs, the Black Guillemot off Portland Castle and 12 Black-necked Grebes and 2 Slavonian Grebes off Sandsfoot Castle. Today came up with a considerable surprise of the wrong sort, with there being no sign all day of the Barred Warbler at the Obs; 2 Blackcaps remained there, 2 Red-throated Divers and a Great Skua passed through on the sea, a Merlin flew south at Portland Castle and a Great Northern Diver, an Eider and the Black Guillemot were in Portland Harbour. With Christmas now out of the way our weekend volunteers will be taking a well-earned break and the bookshop will be closed on Saturdays and Sundays throughout January and February. We'll usually still be able to open the shop on request but if you're travelling any distance to buy a book we'd recommend you give us a quick ring beforehand to make sure we'll be about. Normal opening times will resume in March. With traditional Boxing Day constitutionals necessarily curtailed from mid-morning by the onset of rain and an ever-freshening wind the only reports were of the Barred Warbler and a Blackcap at the Obs, 9 Red-throated Divers and a Great Northern Diver through off the Bill and the Black Guillemot and an Eider in Portland Harbour. Only very limited coverage today and nothing new to report: the Barred Warbler and at least 1 of the Blackcaps was at the Obs, the Chiffchaff remained at Southwell, a Black Redstart was at Portland Castle and 4 Eider, a Great Northern Diver and the Black Guillemot were still in Portland Harbour. Today's limited observations did little more than confirm the continuing presence of a few long-stayers: 2 Blackcaps and the Barred Warbler remained at the Obs, the Pheasant and Chiffchaff were still at Southwell and the Eider and Black Guillemot was still off Portland Castle; the only extras were 4 Red-throated Divers and a Black-throated Diver through off the Bill and a Great Northern Diver at Ferrybridge. ...whilst there's nothing particularly unusual about decent concentrations of feeding seabirds off the Bill, so far this winter auks have featured far less conspicuously than we've got used to: by the last third of December in most recent winters totals in excess of 20000/hour haven't been at all unusual, but this month there have been few days when the corresponding totals have got beyond the high hundreds. One or two unexpected happenings at the Bill today where a Merlin was a good mid-winter record and 39 Brent Geese headed up-Channel. The Barred Warbler lingered on at the Obs for another day, whilst more mundane fare included 2 Purple Sandpipers and a Blackcap at the Bill, 8 more Red-throated Divers and a Great Skua through on the sea there, the Black Guillemot and Eider still off Portland Castle, 59 Oystercatchers at Ferrybridge and singles of Red-throated Diver and Great Northern Diver through overhead there. 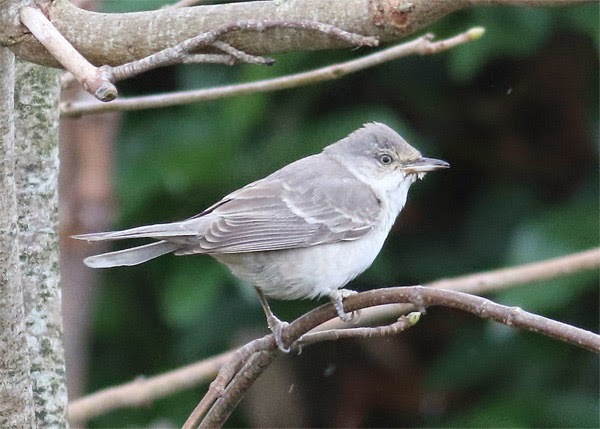 The Barred Warbler - now beginning its fourth week in residence - continued to provide the principal interest, with few signs that the prevailing Atlantic-influenced weather is going to do us any other favours in a hurry. The day's other reports consisted of 3 Purple Sandpipers and at least 1 of the Blackcaps still at the Obs, 2 Common Scoter and a Red-throated Diver through on the sea at the Bill, singles of Pheasant, Grey Wagtail and Chiffchaff still about at Southwell, the Black Guillemot still of Portland Castle and 1200 Dark-bellied Brent Geese, 6 Pale-bellied Brents and a Bar-tailed Godwit at Ferrybridge. The shortest day of the year seemed even shorter than usual in frequent drizzle and under a constantly dreary sky. The Barred Warbler and 2 Blackcaps remained at the Obs and 7 more Red-throated Divers, 4 Common Scoter and 2 Brent Geese passed through off the Bill. 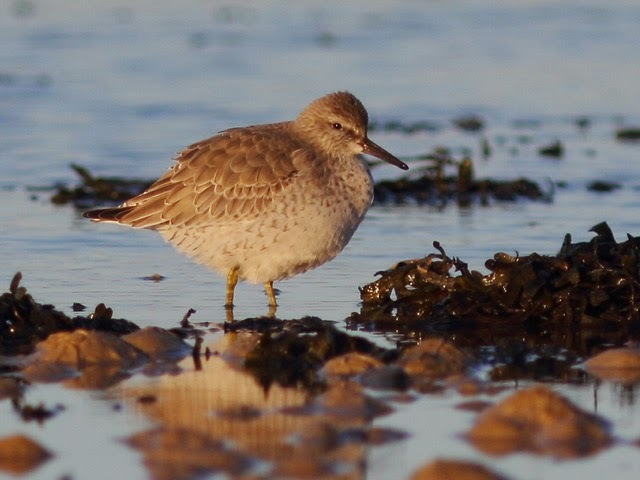 The only other news came from Portland Harbour/Ferrybridge where 15 Pale-bellied Brent Geese, 12 Black-necked Grebes, 2 Slavonian Grebes, the Black Guillemot and singles of Black-throated Diver and Grey Plover made the list. 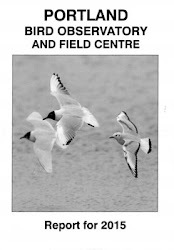 A reminder that the next In Focus field event at the Obs takes place between 10am and 4pm this Tuesday, 23rd December. Although the Barred Warbler continued to put on a good show there was no escaping the reality of rather repetitious mid-winter birding setting in. The only noticeable changes from events in recent days were an increase to 10 in the Pale-bellied Brent Goose total at Ferrybridge and signs of some Redwing passage still underway, with 10 at Portland Castle and a few on the move over the Bill after dark. Routine fare included 6 Purple Sandpipers and a Black Redstart at the Bill, 9 Red-throated Divers and 3 Common Scoter through on the sea there, 2 Black Redstarts in the Portland Castle/Osprey Quay area and the Eider and Black Guillemot still about off Portland Castle. A fresher, bright and breezy day saw a notable influx of Barred Warbler watchers but there were few new discoveries to report. Five Pale-bellied Brent Geese were at Ferrybridge for the first time for a few days, 3 Eider, 2 Common Scoter and the Black Guillemot were in Portland Harbour, 2 Purple Sandpipers, the Barred Warbler and singles of Black Redstart and Blackcap remained at the Bill and 3 Red-throated Divers passed through off the Bill. More damp, dreary and windy conditions dented enthusiasm for fieldwork today and reports were limited to the Barred Warbler and singles of Purple Sandpiper, Redwing, Black Redstart and Blackcap at the Bill and a Red-throated Diver through offshore there. 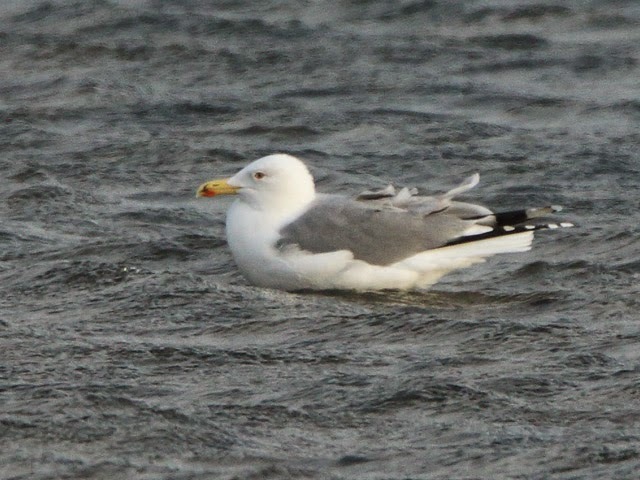 A mild, dreary and breezy day saw most of the now standard selection make the list. The Barred Warbler, Black Redstart, Blackcap and 3 Purple Sandpipers remained at the Bill and 12 Black-necked Grebes, 5 Great Northern Divers, 4 Eider and the Black Guillemot were still in Portland Harbour; odd one and twos of Redwings scattered about may or may not have been new arrivals. 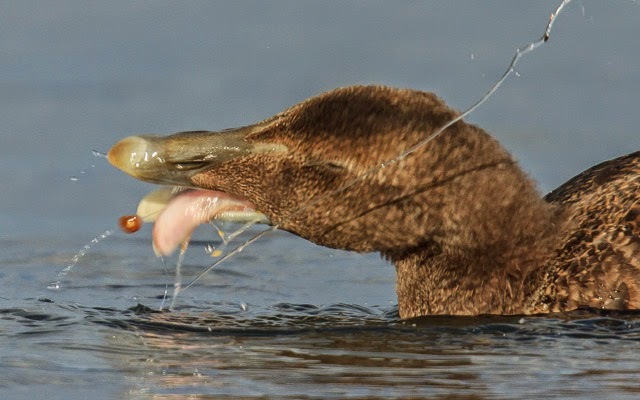 The only news from the sea concerned 2 Red-throated Divers through off the Bill. The Barred Warbler continued to provide more than enough interest for a mid-December day but there were also encouraging signs of late migrants still trickling through, with several Blackbirds and Song Thrushes, a Robin and a Bullfinch all new in at the Obs; winterers on offer there included 5 Purple Sandpipers, a Black Redstart and a Blackcap, whilst further Black Redstarts remained on station at Blacknor, Chesil Cove (3) and Portland Castle, and singles of Pheasant, Grey Wagtail, Redwing and Chiffchaff were at Southwell. 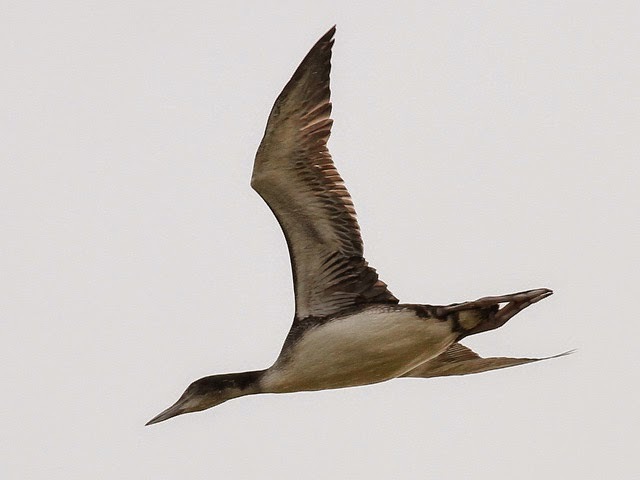 A Red-throated Diver was new at Portland Harbour, where 4 Eider, the Black Guillemot and a variety of divers and grebes were all still present. 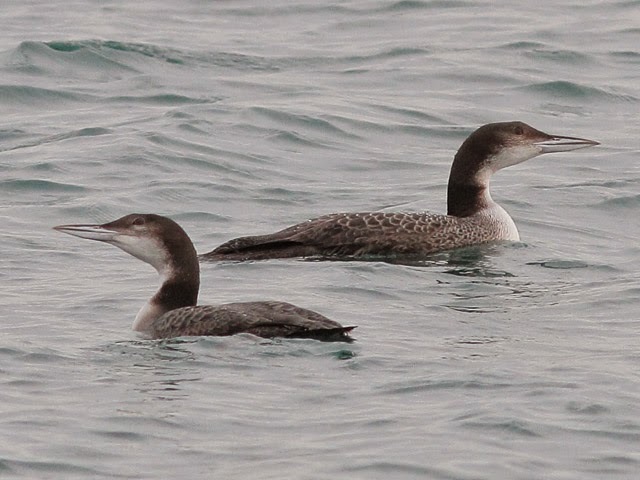 The calm, sunny conditions also produced the best offshore movement of Red-throated Divers so far this winter, with 22 through off the Bill during the morning. 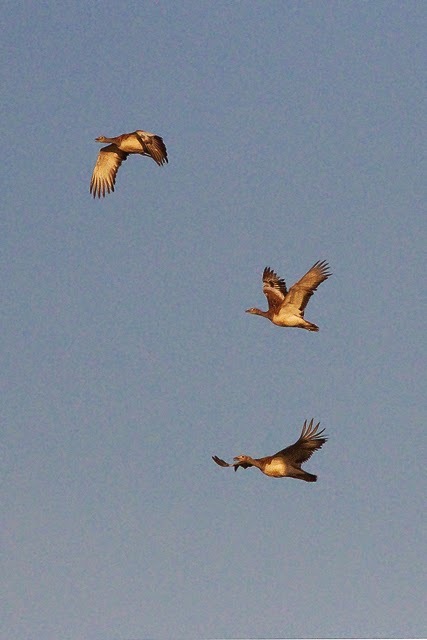 Finally, Portland's attraction for dodgy Great Bustards continued with 3 doing a quick tour overhead during the morning. A Red Admiral was on the wing at the Obs. Very little change today, with just an extra Blackcap joining the Barred Warbler and Blackcap already ensconced on the skewered apples at the Obs and a new Redwing dropping in briefly there; 4 Purple Sandpipers and a Black Redstart were still at the Bill and the Black Guillemot, 4 Eider and assortment of other waterfowl still in Portland Harbour. A Red Admiral was on the wing at Reap Lane. 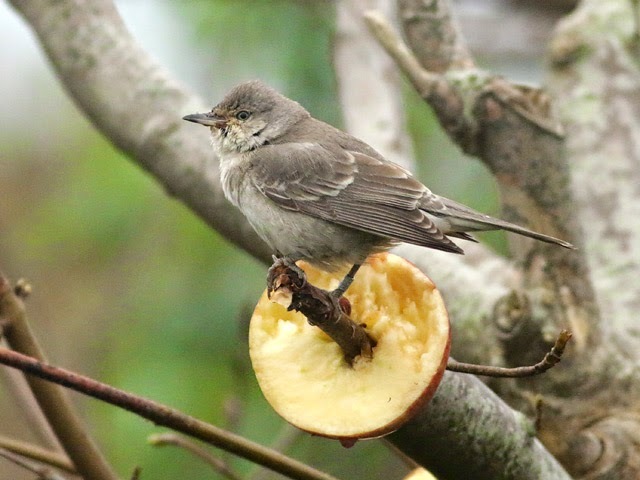 On an increasingly windy and wet day the Barred Warbler successfully completed a fortnight in residence at the Obs and remained the star attraction; 3 Purple Sandpipers, a Black Redstart and a Blackcap at the Obs constituted the only other reports of note from the land. Sea interest perked up, with 15 Red-throated Divers, 3 Great Skuas and 2 Red-breasted Mergansers through off the Bill, a Yellow-legged Gull dropped in at Ferrybridge and the Black Guillemot, 4 Eiders, 2 Common Scoters and usual selection of divers and grebes remained in Portland Harbour. Lovely quiet, sunny conditions - together with it being a weekend day - saw the Barred Warbler attract a constant stream of visitors (we counted nearly 70 through the day and there were probably a few we missed). A few new arrivals were also in evidence, with 2 each of Redwing and Fieldfare and a single Siskin overhead at the Bill and 50 Wood Pigeons heading south over the Windmills; lingerers on the land included 4 Purple Sandpipers, 2 Water Rails, a Black Redstart and a Blackcap at the Bill, 2 Goldcrests at Avalanche Road, singles of Chiffchaff and Firecrest at Pennsylvania Castle and 2 Black Redstarts at Blacknor. 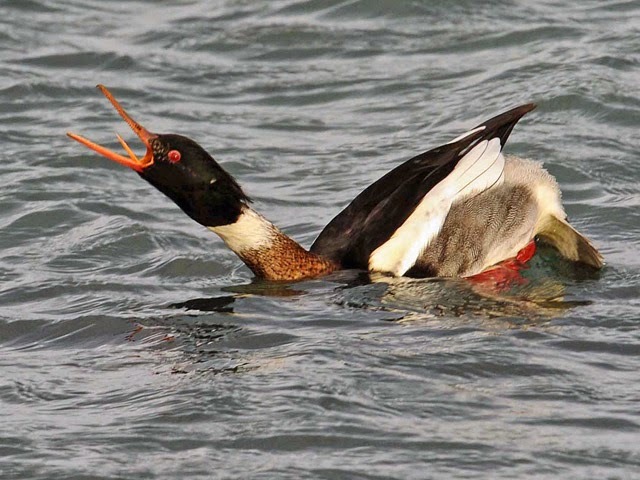 Five Red-throated Divers and a Red-necked Grebe passed through off the Bill and Portland Harbour was largely unchanged, with the Black Guillemot, 4 Eiders and a decent spread of divers and grebes still about. Not much change today, with a passing Great Skua off the Bill the only legacy of what had been a pretty stormy night. Both the Barred Warbler and Blackcap lingered on at the Obs but 2 Black Redstarts at Chesil Cove represented the only other report of note from the land. Portland Harbour remained quite busy, with 12 Black-necked Grebes, 5 Great Northern Divers, 4 Eider, 2 Common Scoter and singles of Black-throated Diver, Slavonian Grebe and Black Guillemot still in residence; 3 Red-throated Divers and a Common Scoter passed through off the Bill. The Barred Warbler continued its vigil around the apples at the Obs and there was another surprise unseasonable sighting today in the form of a passing Swallow at Ferrybridge. 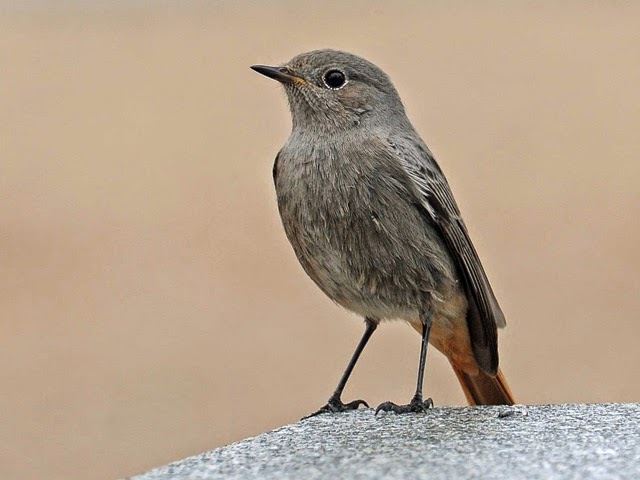 With it still more than windy enough to deter most routine coverage of the land the only other reports from there were of single Black Redstarts at Blacknor, Easton and Yeates Corner. Three Eider, 2 Common Scoter and a Great Northern Diver were in Portland Harbour, 2 Pale-bellied Brent Geese were still at Ferrybridge and 3 Great Skuas passed through off the Bill. Although the Barred Warbler continued to steal the show it was the sheltered waters of Portland Harbour that came up with the best of the new arrivals on a very blustery day, with 2 Slavonian Grebes and a Goosander adding variety to the 12 Black-necked Grebes, 3 Eider, 2 Common Scoter and long-staying Black Guillemot already present; also on the sea, 5 Red-throated Divers passed through off the Bill, with 2 more settled at Chesil Cove and another single passing through there. Two Purple Sandpipers, a Black Redstart and a Blackcap remained at the Bill and another Black Redstart was at Westcliff Road. With the obvious exception of the Barred Warbler that continued to attract a steady stream of visitors at the Obs today's offerings were very much standard winter fare: 4 Purple Sandpipers and a Blackcap at the Bill where 9 Red-throated Divers and a Black-throated Diver also passed through on the sea, a Chiffchaff at Southwell, 6 Pale-bellied Brent Geese at Ferrybridge and 3 Eiders and 2 Great Northern Divers in Portland Harbour. 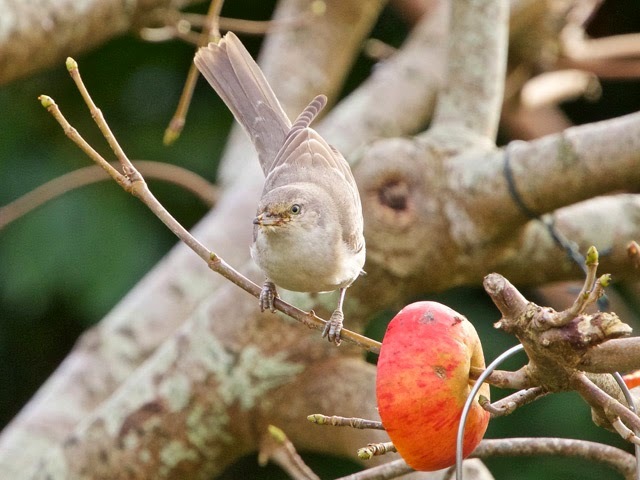 The continuing presence of the Barred Warbler ensured that there were far more visitors than would be usual on a day of north-westerlies in December; a bit disappointingly though, for the majority the Obs was just one stop on a merry-go-round of Dorset sub-rarities so there was actually precious little coverage of most of the island. A Redwing was new at the Obs and 11 Black-necked Grebes, 3 Eider, 2 Common Scoter, a Great Northern Diver and the Black Guillemot were in Portland Harbour. 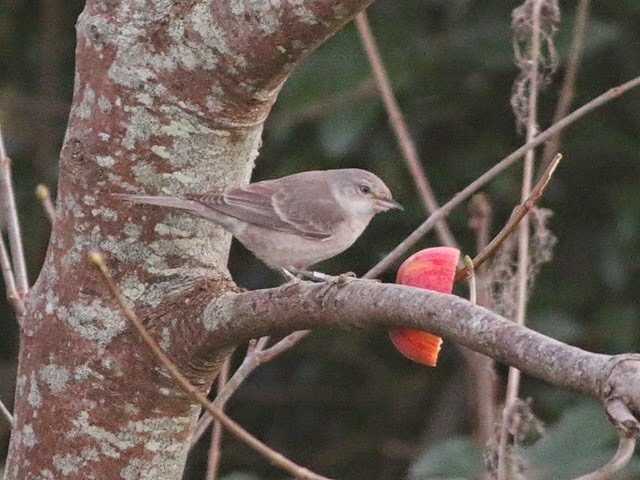 With the Barred Warbler settling down to making regular visits to the apples in the Obs garden it attracted most of the attention today; the only 'extras' making the list came as a result of a marked freshening of the westerly wind that saw late singles of Manx Shearwater and Arctic Skua pass through at the Bill and Ferrybridge respectively. Lingerers still about included 2 Black Redstarts and a Blackcap at the Bill, a Black Redstart at Blacknor, the Black Guillemot and Eider still off Portland Castle and 2 Pale-bellied Brent Geese at Ferrybridge; additionally, 2 Red-throated Divers passed by off the Bill and a Black-throated Diver passed over at Ferrybridge. 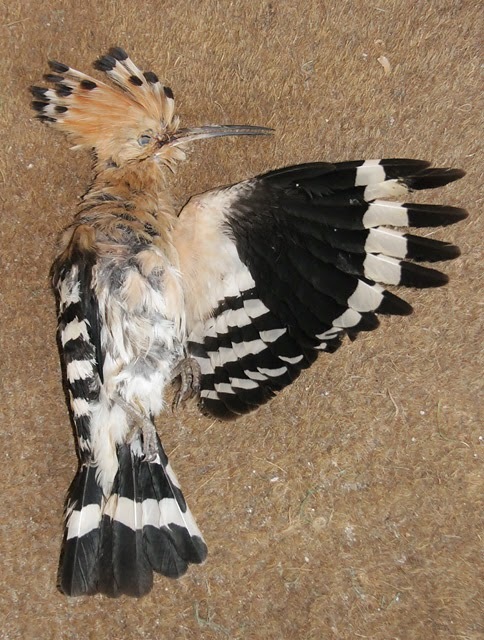 We know absolutely nothing about ageing Hoopoes and haven't fully understood what we've attempted to glean from the literature; however, the presence of, for example, two new outer tail-feathers amongst other features seem to suggest that this one is a juvenile/first-winter. Another lovely day produced quite a surprise in the form of the reappearance - right at dusk in the Obs garden - of the Barred Warbler that had somehow managed to escape attention for nearly four days. Newcomers were again thin on the ground, with 3 Redwings and a Blackcap the only obvious arrivals at the Bill; a Firecrest at Pennsylvania Castle, 2 Black Redstarts at Blacknor, the Black Guillemot off Portland Castle and 2 Pale-bellied Brent Geese and a Knot at Ferrybridge were about the best of the spread of long-stayers. 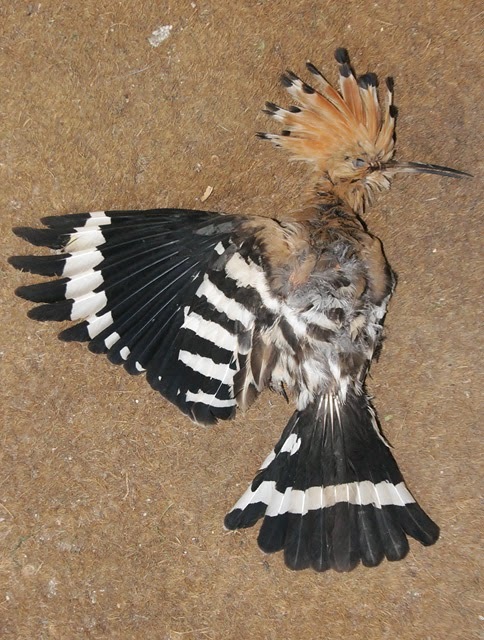 News was also received of a Hoopoe found dead yesterday at Wakeham. Red Admirals were on the wing at the Obs and Pennsylvania Castle. Whilst not entirely bereft, the island was hardly jumping with newcomers which was a shame as it was a pleasure to be out in conditions that were a vast improvement on yesterday's damp and gloom. Five Redwings, a Little Egret and a Chiffchaff were fresh in at the Bill, where a Blackcap remained and 9 Common Scoter and 2 Red-throated Divers passed by on the sea. Singles of Pheasant, Blackcap, Chiffchaff and Goldcrest were at Southwell, 2 more Chiffchaffs were still at Pennsylvania Castle where the Firecrest tally increased to 3; a Black Redstart was also still at Blacknor. 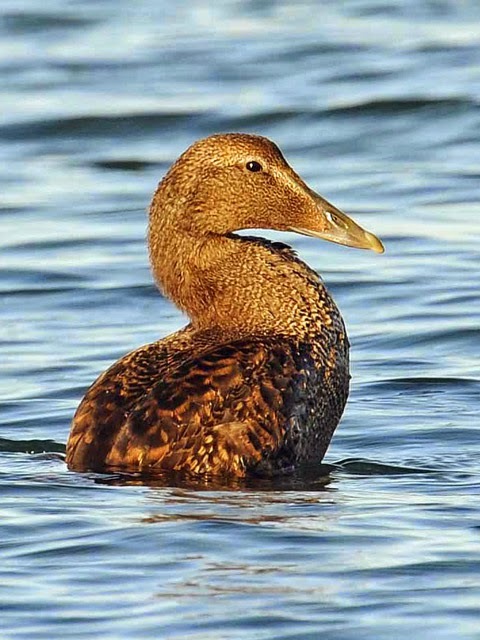 Finally, at least 2 new Eider joined the single already present in Portland Harbour. A relentlessly dreary, damp and chilly day. A handful of thrushes made landfall at the Bill, amongst which a most unexpected prize was another late Ring Ouzel that headed off north after spending a few minutes in and around the Obs garden; a Little Egret and a Lapwing were also new there, a Red-throated Diver passed by on the sea and 4 Purple Sandpipers and a Blackcap were still present; elsewhere a Pheasant at Southwell, a Lapwing at Barleycrates Lane and 2 Black Redstarts at Blacknor were all of note. Despite the brisk and chilly northerly being a nagging feature all day unseasonable migrants continue to appear, with a Hoopoe at the Bill being today's offering: first found near the lighthouse during the morning it continued to roam that area and the hut fields for the rest of the day. Newcomers were otherwise few and far between, with 2 Redwings at the Bill and a Mistle Thrush at Blacknor being about the best on offer; lingerers included 2 Purple Sandpipers and singles of Black Redstart and Blackcap at the Bill, 5 Chiffchaffs, 4 Goldcrests and 2 Firecrests at Pennsylvania Castle and 3 Black Redstarts at Blacknor. 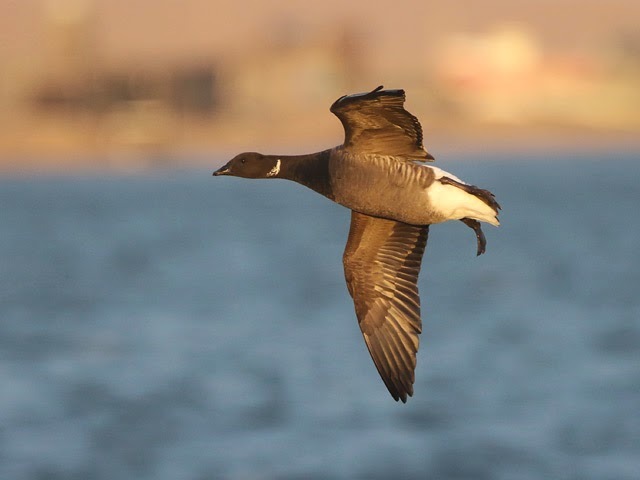 Three Brent Geese and a Red-throated Diver through off the Bill were the only reports from the sea. Suddenly feeling pretty raw today with a blasting northerly having set in during the late hours of the night. The Barred Warbler remained at the Bill - now in the hut field next to the Obs garden - as did singles of Black Redstart and Blackcap, but new arrivals there consisted of just 4 Redwings and 2 Lapwings; 10 Red-throated Divers also passed through on the sea. 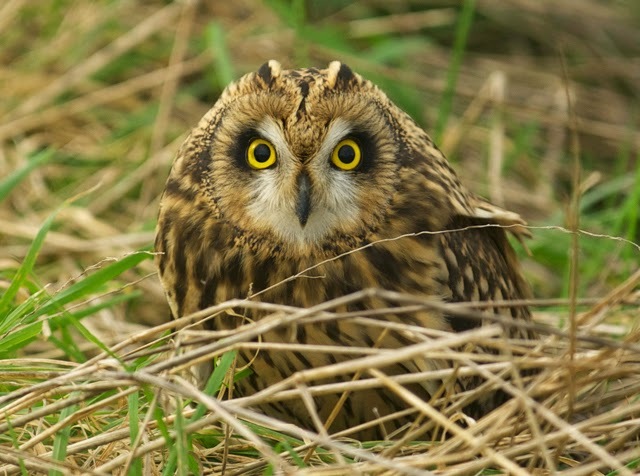 The only other reports were of a Snipe over the Windmills and a Pheasant in the Borstal park at the Grove. Singles of Diamond-back Moth and Rusty-dot Pearl were the only immigrant moths caught overnight at the Obs. 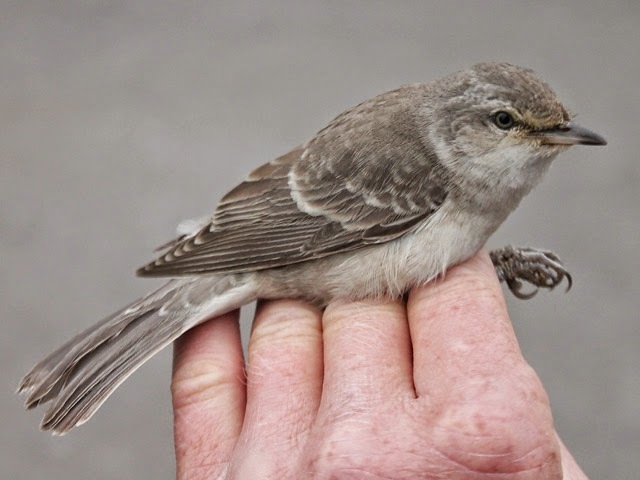 If November went out in style then December came out of the blocks in much the same vein when a Barred Warbler was trapped and ringed at the Obs shortly after dawn; although there have been three previous November records of Barreds (the latest of which was on 14th) this was the first for the month of December. At a local level, the morning also came up with a potentially even bigger rarity when 4 likely Egyptian Geese passed through off the Bill; sadly though the observer wasn't completely confident on the tail-end views that Ruddy Shelduck had been satisfactorily eliminated so this Bill tick will have to be put in abeyance...at least until they're found on the Fleet tomorrow! With the clear skies of the weekend replaced by constant heavy cloud cover tardy migrants were downed at a steady rate throughout the morning. Thrushes accounted for the bulk of the numbers at the Bill, where 72 Redwings, c50 Blackbirds, 11 Fieldfares and a Mistle Thrush arrived in off the sea and trickled away northwards; 3 new Blackcaps also joined a weekend left-over there and a Curlew passed through, whilst lingerers still about included singles of Short-eared Owl, Black Redstart and Chiffchaff, with further Black Redstarts at Reap Lane (2), Blacknor and Portland Castle. Noteworthy sightings from the sea included 6 Red-throated Divers, 5 Eider, a Brent Goose and a Great Skua through off the Bill. The moth immigrant tally remained at a samey level, with 4 Rusty-dot Pearl and 3 each of Diamond-back Moth and Silver Y caught overnight at the Obs. Nick Hopper was with us again at the weekend (Saturday night/Sunday morning) undertaking another session of nocturnal sound recording. This was quite an interesting night to try the technique as the sky remained more or less clear throughout (it was starlit and with a half moon visible well into the early hours before some low mist formed for a while) and to the unassisted ear it sounded like the volume of passage overhead was fairly slight; however, Nick reports that the dish picked up totals of 219 Redwings, 19 Song Thrushes, 12 Blackbirds, 4 Fieldfares and singles of Lapwing and Dunlin in a four hour period from 21.40 to 01.40 before - maybe surprisingly - passage dwindled once the mist had set in. Our other news concerns the Western Bonelli's Warbler trapped and ringed at the Obs back in August. 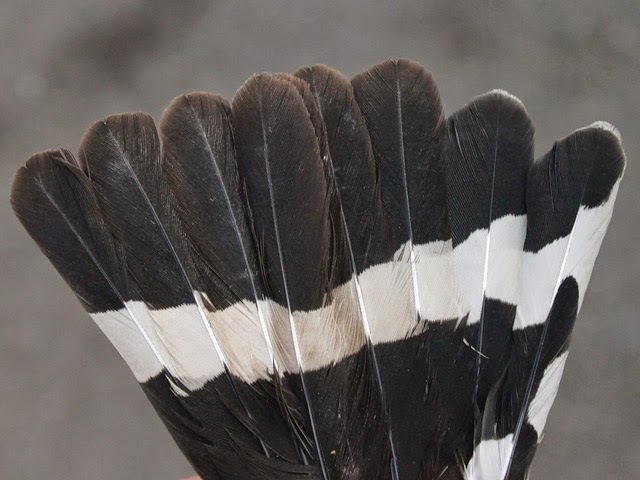 Although this bird conformed in all tangible respects to a Western as opposed to an Eastern Bonelli's, during the handling process we did happen to come by a couple of feathers which we thought we may as well submit to Dr Martin Collinson at the University of Aberdeen for mtDNA analysis. 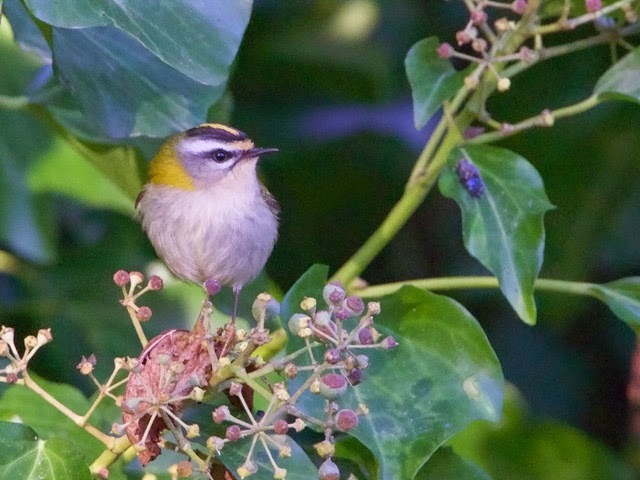 Martin has very kindly been in touch as follows: 'finished the Western Bonelli's from Portland (18/8/2014, HBV514) (our ref PBo01).......confirms it's Western, of course, novel sequence but 2-3 bp different from 3 Western Bonellis, 2-5 bp difference (/932 bp) in GenBank, at least 25 bp different from any Eastern Bonelli's, and also 25 bp different from sibilatrix'. 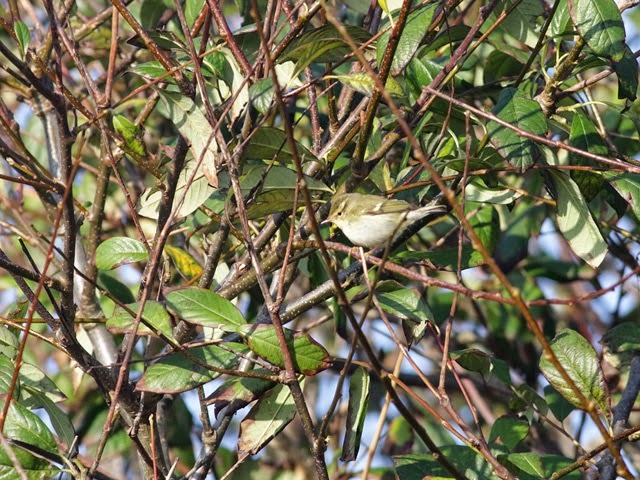 Sometimes one little event encapsulates so much more, and today it was the Yellow-browed Warbler dropping out of a clear blue sky into the top of a now leafless sycamore in the Obs garden at midday that summed up a lot of what's gone before during this month - things like this really shouldn't be happening on the last day of November. 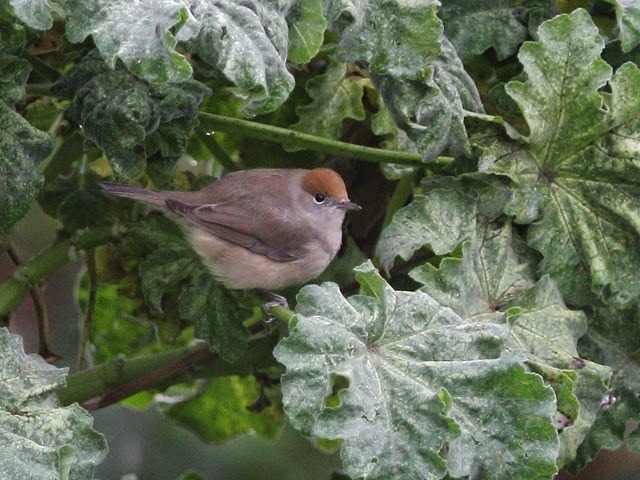 As it was, the Yellow-browed wasn't alone since 3 new Blackcaps popped up in mist-nets at the Obs at almost the same moment, while the morning had seen a steady little trickle of thrushes arriving in off the sea and making off northward. Yesterday's unseasonable Wheatear at the Bill lingered for a second day, whilst the Hoopoe again added colour to proceedings, although on this occasion it was watched heading north over Osprey Quay so might finally have been making an escape from the island. The day's routine fare included 22 Redwings, c20 new Blackbirds, 8 Fieldfares and singles of Lapwing, Black Redstart and Chiffchaff at the Bill, together with 2 Red-throated Divers and 2 Shoveler through on the sea there, 3 Black Redstarts at Blacknor and several Black Redstarts and the Black Guillemot at Portland Castle. Red Admirals were still on the wing at the Obs, where 9 Rusty-dot Pearl and singles of Diamond-back Moth and Silver Y made up the overnight immigrant moth catch. 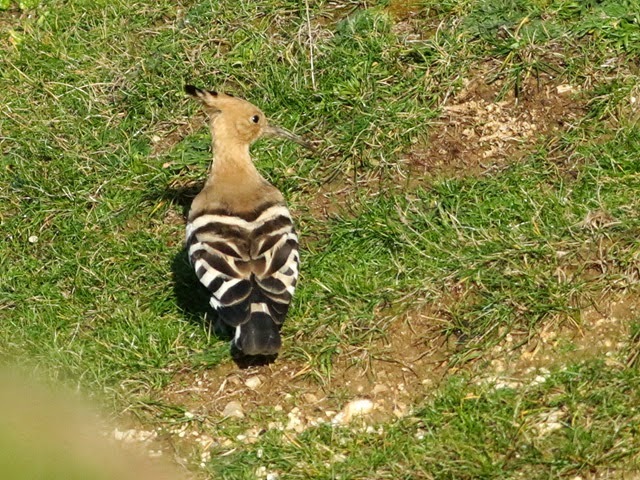 Winter again seemed a long way off on a day of unbroken sunshine, unseasonable warmth, butterflies on the wing and Hoopoe and Wheatear on the bird list; the Hoopoe - perhaps the elusive Southwell bird getting wanderlust? 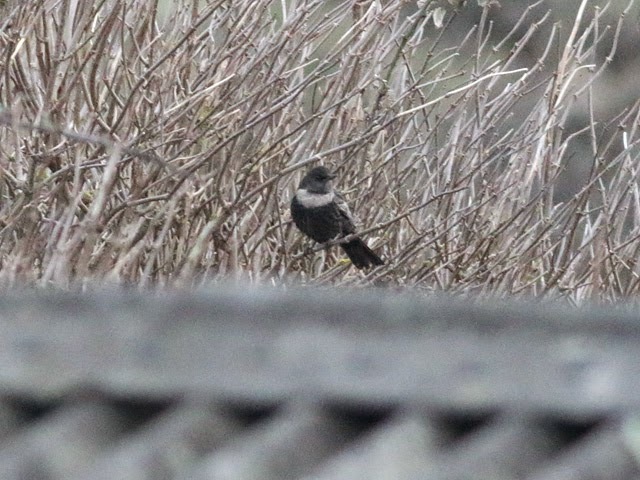 - was reported first at Kingbarrow Quarry and later in the Portland Castle area but couldn't be pinned down at either, whilst the Wheatear showed up at the Bill. Bird-wise, there were few other surprises: new arrivals were limited to singles of Redwing and Fieldfare, lingering Black Redstarts included 4 at Portland Castle, 2 at Blacknor and 1 at the Bill, 5 Great Northern Divers, the Eider and the Black Guillemot remained in Portland Harbour and the odd few Chiffchaffs and Goldcrests lingered on in sheltered spots everywhere. The stiff east wind didn't die down until very late in the night so the immigrant moth catch at the Obs was limited to 4 Rusty-dot Pearl, 3 Silver Y and 2 Diamond-back Moth, with a few more of the same attracted to garden traps at Sweethill and the Grove. The strength of the blasting easterly was more than enough to put the mockers on what had looked quite promising overnight mothing conditions as well as seriously hinder daytime birding forays. New arrivals were limited to a lone Redwing at the Bill, singles of Merlin, Snipe and Ring Ouzel in the Watery Lane/Windmills area and singles of Red-throated Diver and Slavonian Grebe in Portland Harbour, whilst lingerers included a Black Redstart and a Blackcap at the Bill, a Firecrest at Wakeham and the Black Guillemot in Portland Harbour. Five Diamond-back Moth and 4 Rusty-dot Pearl constituted the overnight immigrant moth tally at the Obs. The calm of dawn didn't last, with a stiffening breeze and occasional drizzly outbreaks featuring by the afternoon. 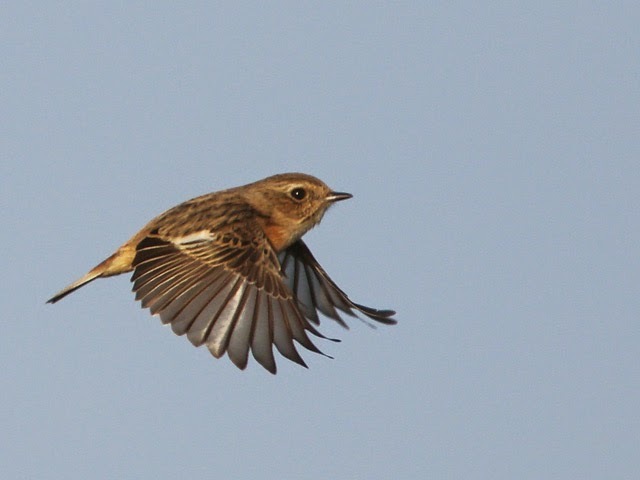 Although 4 Black Redstarts, 2 Blackcaps and 2 Chiffchaffs remained at the Bill newcomers there were limited to 16 Starlings arriving from the south, 2 Redwings, a Snipe and Fieldfare. 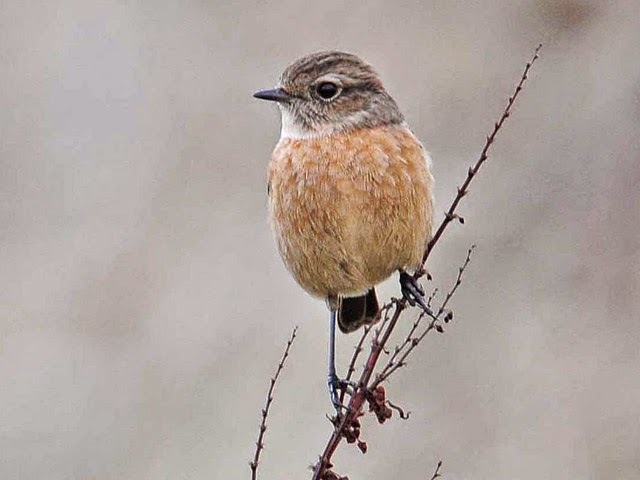 Richer rewards around the middle of the island included 3 Black Redstarts 2 Blackcaps and a Siberian Chiffchaff at Weston and a late Wheatear near the Windmills. 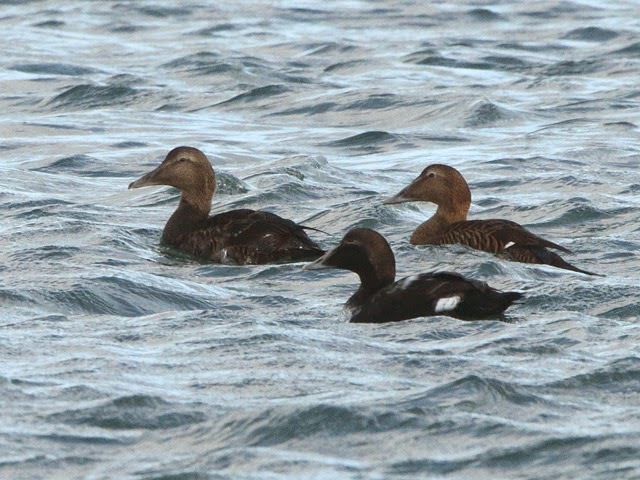 The Eider and Black Guillemot remained in Portland Harbour. The calm, dreary conditions overnight were much more favourable for moth-trapping, with 8 Rusty-dot Pearl, 5 Diamond-back Moth, 2 each of Dark Sword Grass and Pearly Underwing, and a single Silver Y making up the immigrant tally at the Obs. In much quieter conditions there was a rather wintery feel to the birding, with little evidence of late passage beyond singles of Redshank and Redwing at the Bill. An almost flat calm Portland Harbour got a good look which revealed a newly arrived Velvet Scoter; 6 Black-necked Grebes, 5 Great Northern Divers, the Black Guillemot and singles of Eider, Common Scoter were also still about there, whilst singles of Mallard and Redshank were of note at Ferrybridge. 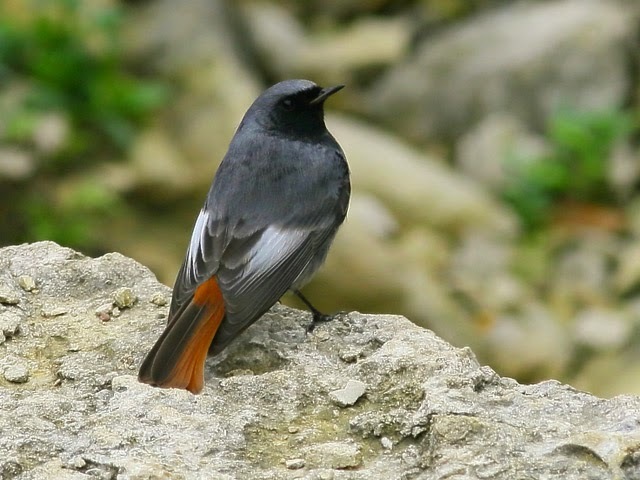 The land came up with 8 Black Redstarts (4 at the Bill and 2 each at Blacknor and Portland Castle), 3 Blackcaps (2 at the Bill and 1 at Portland Castle), a scatter of Chiffchaffs everywhere and 4 Purple Sandpipers and a Short-eared Owl at the Bill; a high count of 36 Rock Pipits around the tip of the Bill was also of interest. Not surprisingly, 2 Diamond-back Moth were the only immigrant moths caught overnight at the Obs. What a contrast to yesterday: shocking weather and lean birding. A day of almost constant rain driven through on a stiff, cold north-easterly saw fieldwork severely curtailed, with precious little evidence of new arrivals on the odd occasions it was possible to venture out. 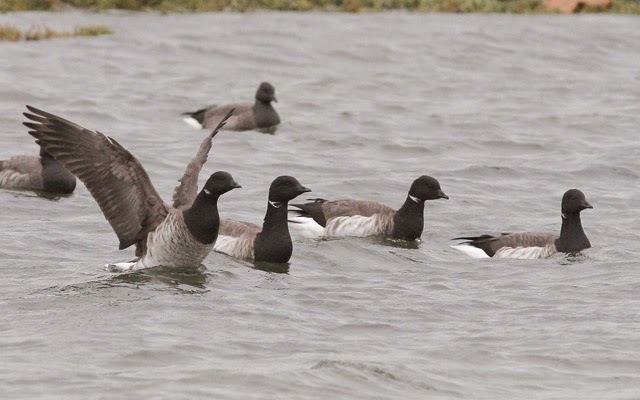 At the Bill 2 Lapwings were new and 2 Black Redstarts, 2 Blackcaps and a Chiffchaff were lingering on from recent days; elsewhere there was another Black Redstart at Blacknor and 8 Pale-bellied Brent Geese at Ferrybridge. Three Diamond-back Moth were the only immigrants caught overnight in the Obs garden moth-traps. 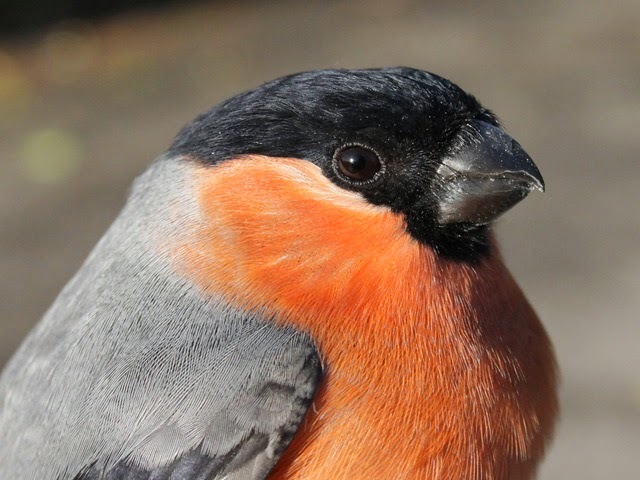 Clear skies and this winter's first touch of frost on the ground represented a profound change over what's gone before thus far this month but the quality of birding continued to exceed expectations. 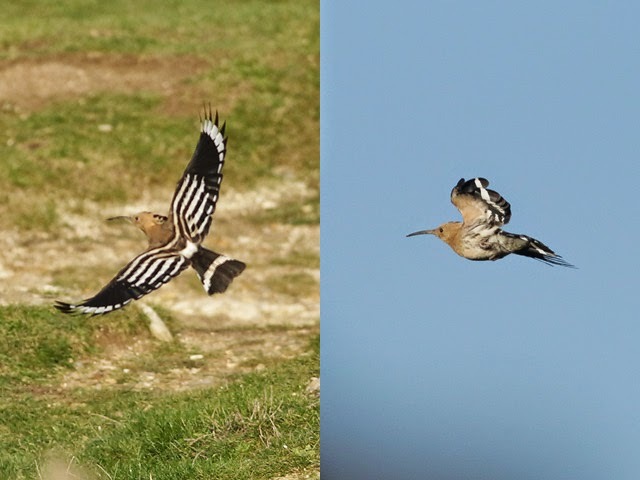 Although the Hoopoe that made a brief reappearance at Avalanche Road, a Lapland Bunting that flew over at the Bill and the ever-present Hooded Crow and Black Guillemot at the Grove and Portland Harbour respectively were the clear winners in the rarity stakes there was almost as much interest in the number of out of season migrants that made landfall at the Bill, where 4 Chiffchaffs, 2 Swallows, a Ring Ouzel and a Willow Warbler all graced the tally. The day's other migrants there were rather more seasonable and included a few dozen new Wood Pigeons and Stock Doves, 11 Fieldfares amongst otherwise small numbers of thrushes, 4 Blackcaps and a Brambling, whilst 6 Lapwings passed over at Ferrybridge; a total of 7 Black Redstarts scattered about the island and a Great Spotted Woodpecker at Easton were perhaps more likely to be winterers. 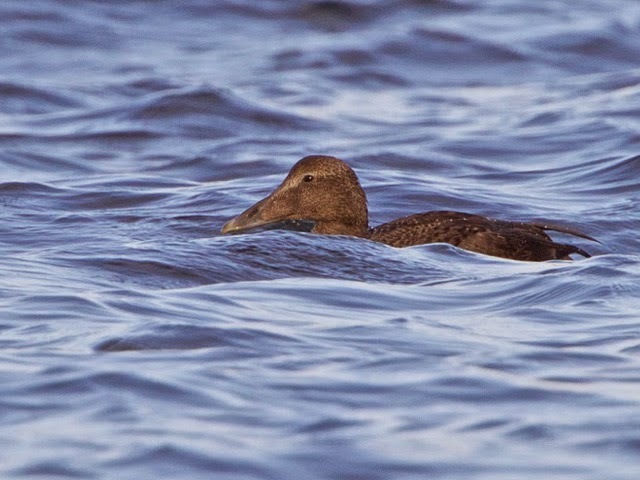 The only reports from the sea were of 11 Common Scoter, 5 Red-breasted Mergansers, 3 Red-throated Divers and a Great Northern Diver through off the Bill. Several Red Admirals and a single Clouded Yellow were amongst butterflies on the wing at the Bill. Despite the plunge in overnight temperatures there were still a few immigrant moths on the wing, with 5 Diamond-back Moth, 3 Rusty-dot Pearl and a Silver Y caught at the Obs. 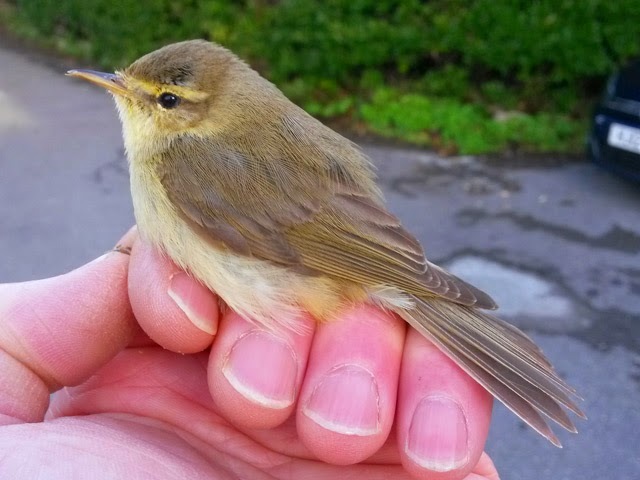 ...the latest ever 'new' Willow Warbler to be trapped and ringed at the Obs. The passage of a cold front and associated rain made for disagreeably trench-footish conditions underfoot but certainly jazzed up the quality of the birding, with a rather motley but nonetheless very worthwhile selection of migrants making the list today. 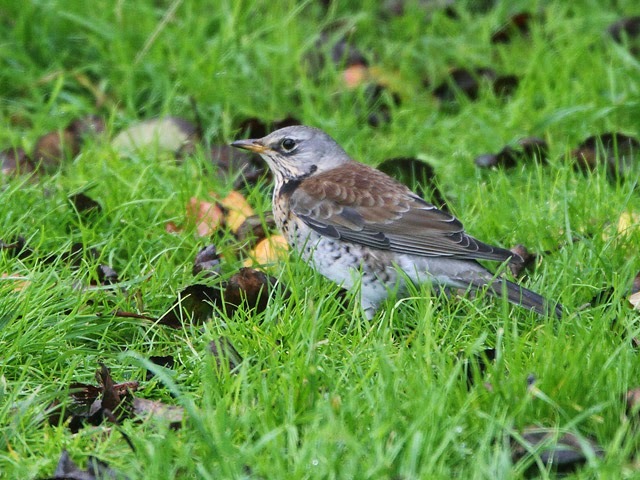 The overnight rain downed a good few thrushes, with 74 Redwings and 7 Fieldfares leaving to the north from the Obs garden shortly after dawn and later a Ring Ouzel heading off in the same direction from Top Fields; also new in were at least 5 Blackcaps, a Lapwing and a Chiffchaff at the Bill, a Bullfinch at Southwell and singles of Wheatear and Snow Bunting at Ferrybridge, whilst a Hen Harrier headed north over Blacknor. 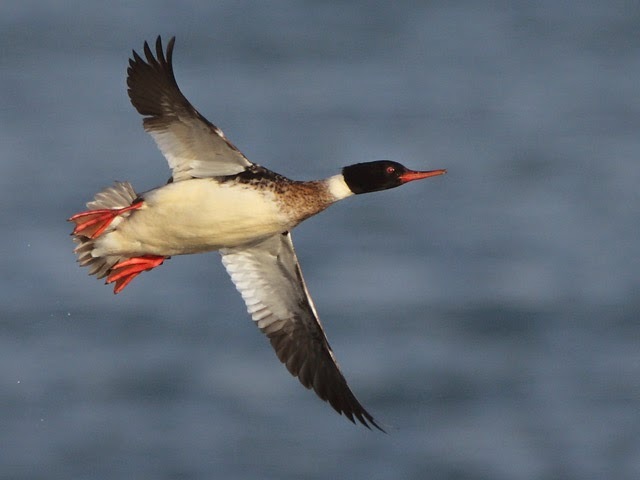 Waterfowl were also on the move, with 7 Greylag Geese, 2 Goosanders and an Eider - along with 46 Common Scoter and a Brent Goose - through off the Bill, and 12 Barnacle Geese north-east over Top Fields; singles of Mute Swan and Eider was new in Portland Harbour. 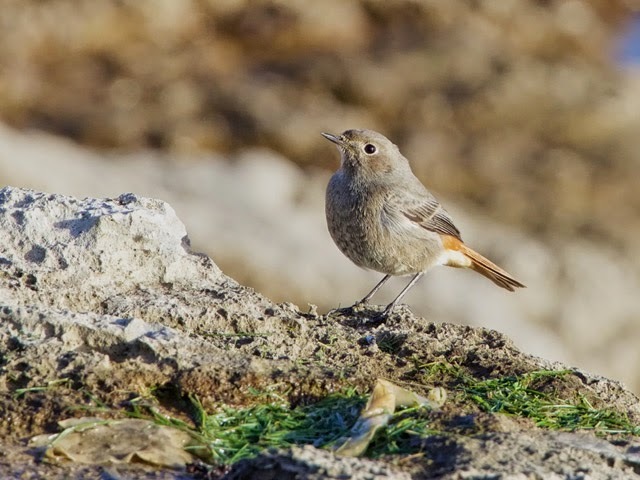 Lingerers still about included Black Redstarts at the Bill (4), Reap Lane (2) and Portland Castle (6), a Short-eared Owl at the Bill, a Great Spotted Woodpecker at Southwell, 2 Knot and a Redshank at Ferrybridge and 6 Black-necked Grebes, 2 Great Northern Divers and a Common Scoter in Portland Harbour. Immigrant moths again featured in far greater numbers/variety than usual at this time of year, with 31 Diamond-back Moth, 18 Rusty-dot Pearl, 5 Silver Y, 3 each of Rush Veneer, Pearly Underwing and Dark Sword Grass, and singles of Gem and Small Mottled Willow caught overnight at the Obs; an Olive-tree Pearl was amongst a similarly wide-ranging catch at Sweethill. Whilst we're sure there's a fair bit of mileage left in the autumn, today was again rather disappointing. Thrushes accounted for the bulk of the new arrivals at the Bill/Southwell, where 38 Redwings and 10 Fieldfares were amongst the thinnish spread of Blackbirds and Song Thrushes; new singles of Blackcap and Chiffchaff were trapped and ringed, while 4 Purple Sandpipers, 3 Short-eared Owls, a Black Redstart and a Goldcrest were lingerers/winterers. 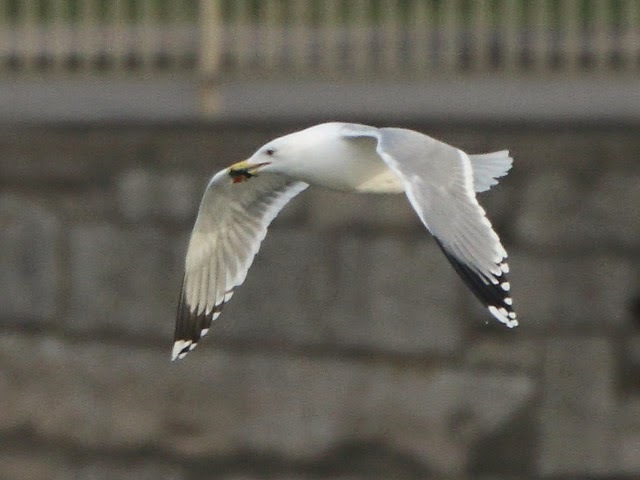 Odds and ends elsewhere included a Firecrest at Pennsylvania Castle, 2 Blackcaps and another Firecrest at Easton Fire Station and 2 Black Redstarts and the Black Guillemot at Portland Castle. A Hummingbird Hawk-moth was on the wing at Blacknor, whilst another small arrival of new immigrants saw totals of 10 Diamond-back Moth, 7 Rusty-dot Pearl, 5 Silver Y and a Pearly Underwing caught overnight at the Obs; an Olive-tree Pearl was the pick of the catch at the Grove. Some days just don't pan out how you think they're going to, and today was one such. With all the right ingredients in the mix - a stiff easterly, lots of birds on the move overhead overnight and the island on the cusp of a weather front arriving from the west - you couldn't have asked for more; sadly, the birds cocked a snook and carried on without giving a second thought to dropping in on Portland. New arrivals at the Bill consisted of little more than a handful of thrushes, 8 Lapwings and singles of Swallow, Blackcap and Goldcrest, with precious little beyond a few more thrushes elsewhere; 5 Purple Sandpipers and 4 Black Redstarts at the Bill and another Black Redstart at Blacknor were presumed winterers/lingerers. The only other news concerned 4 Brent Geese, a Great Northern Diver, a Sandwich Tern and a reported Sabine's Gull through off the Bill and 2 Knot and singles of Pale-bellied Brent Goose, Grey Plover and Redshank at Ferrybridge. 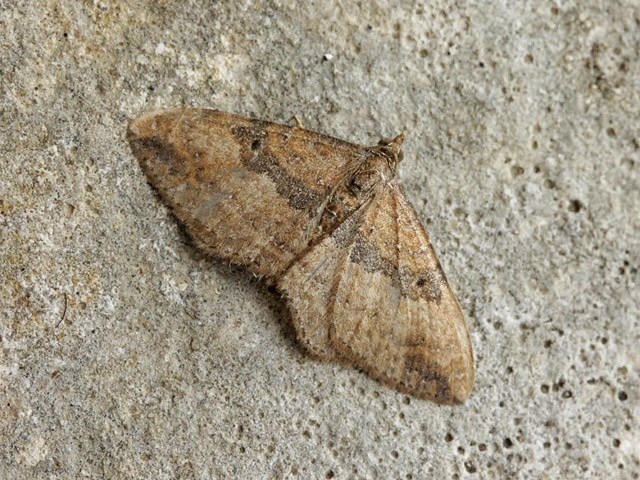 The overnight immigrant moth catch at the Obs consisted of 2 Diamond-back Moth and singles of Rusty-dot Pearl, Dark Sword Grass and Pearly Underwing. 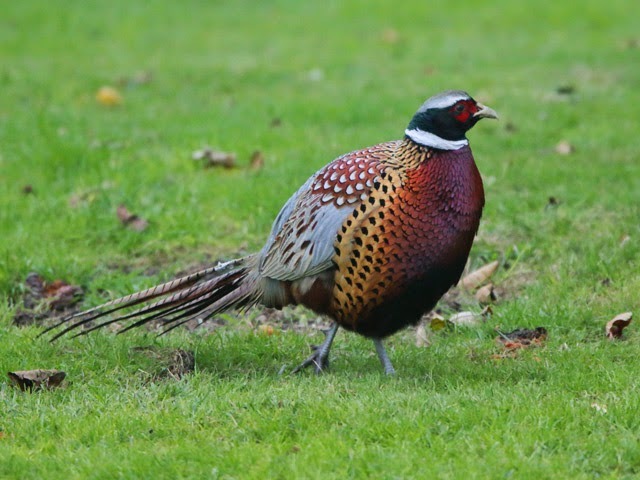 Grahame Walbridge - who recognised the call immediately from our recording - tells us that he hears this call rather frequently in the Blacknor area, where several individuals are usually present throughout the winter, and suggests that in those circumstances it might be used to advertise/delineate winter feeding 'territories'. After a night when it sounded like there were at times prodigious numbers of migrants on the move over the island it wasn't too much of a surprise to find the daylight hours coming up with bags of variety, although on the debit side the only rarity news concerned reports of both the Hoopoe at Southwell and the Dusky Warbler at Blacknor being heard but not seen. Thrushes made up the bulk of the numbers overnight and although most had moved through by dawn there was nonetheless a decent enough spread during the day, with 50-60 each of Redwing, Song Thrush and Blackbird at both the Bill and mid-island; a few Fieldfares also trickled through and a lone Ring Ouzel dropped in at the Bill. An unexpected feature at the Bill was the number of smaller migrants still arriving: 5 Chiffchaffs, 2 Goldcrests and a Firecrest trapped and ringed at the Obs mightn't sound like a lot but constitutes an almost unprecedented event for the last third of November. A very varied list of back-ups included another spread of at least 15 Black Redstarts (with 6 each at Reap Lane and Church Ope Cove); 5 Lapwings, 2 Grey Herons and a Goosander at the Bill, 6 Lapwings, 3 Swallows, 3 Blackcaps and 2 Snipe at various mid-island sites and 35 Lapwings and singles of Great Northern Diver, Grey Plover and Redshank overhead or settled at Ferrybridge. 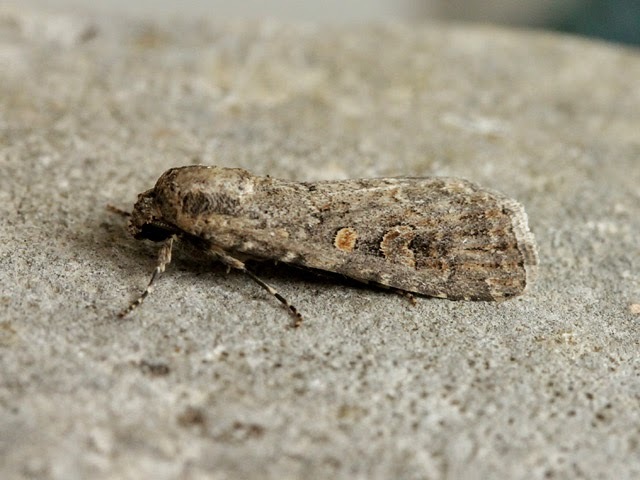 Immigrant Lepidoptera making the list included singles of Painted Lady at the Bill and Hummingbird Hawk-moth at Southwell; an Olive-tree Pearl was caught overnight at the Grove, with 10 Rusty-dot Pearl, 3 Silver Y and a Diamond-back Moth making up the catch at the Obs. Another day, another Dusky Warbler: although they're not quite coming along like buses the second Dusky Warbler in a week - this one at Blacknor Fort - did nothing but confirm that this once quality rarity has reached the 'almost to be expected' level in this time of year. 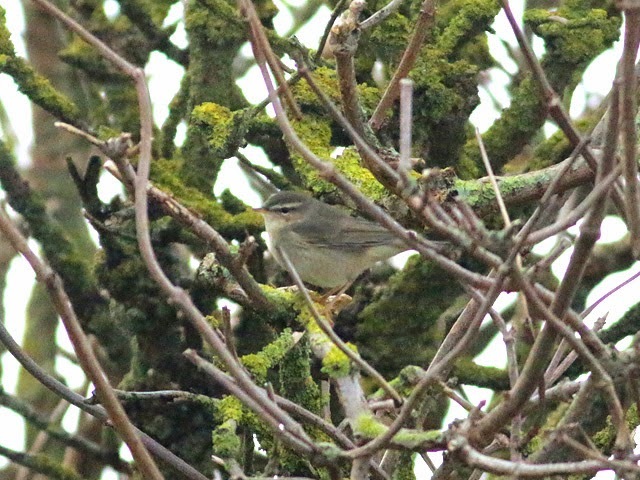 With a brisk south-easterly blowing there was no shortage of expectation that the Dusky mightn't have been travelling alone, but in the event the only other oddity to surface was a Yellow-browed Warbler at Avalanche Road - although a very late Willow Warbler there was probably an even greater surprise. Migrant numbers were otherwise quite disappointing, with thrushes reduced to a mere handful; 4 Lapwings, 2 Short-eared Owls, a Little Egret, a Merlin and new singles of Chiffchaff and Goldcrest at the Bill, and a Swallow at Avalanche Road were the best of the rest on the land, whilst 7 Brent Geese, 3 Red-throated Divers and a Teal passed through on the sea at the Bill. Hints that the conditions might have been looking more favourable for immigrant moths proved wide of the mark, with 7 Rusty-dot Pearl, a Diamond-back Moth and a Silver Y the only overnight captures at the Obs. The continuing easterly wind again paid dividends on the migrant front with a pretty respectable tally for mid-November. The Hoopoe remained in the Southwell/Suckthumb Quarry area, but the day's only other oddity was a Yellow-browed Warbler that made a brief early morning visit to the Obs garden. 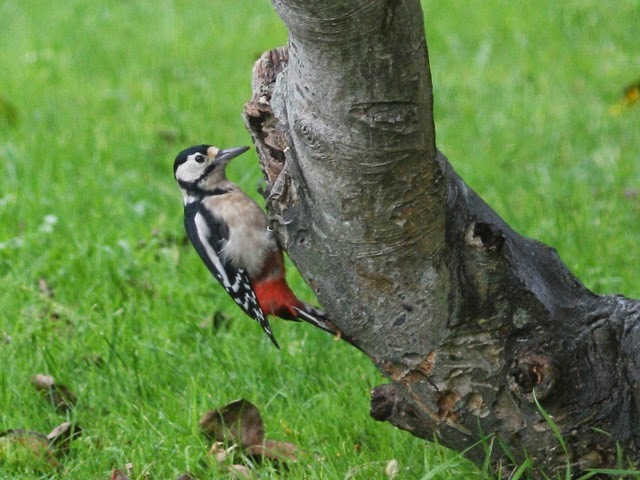 The list at the Bill included a mix of lingerers/new arrivals amongst which 31 Lapwings, 5 Black Redstarts, 3 Woodcocks, 3 Blackcaps, 2 Short-eared Owls, 2 Swallows and an Arctic Skua were of particular note; a Mistle Thrush at Weston Street, a Swallow at Barelycrates Lane, a Firecrest at Wakeham, the Black Guillemot off Portland Castle and a scatter of 8 Black Redstarts were the best of the bunch elsewhere. 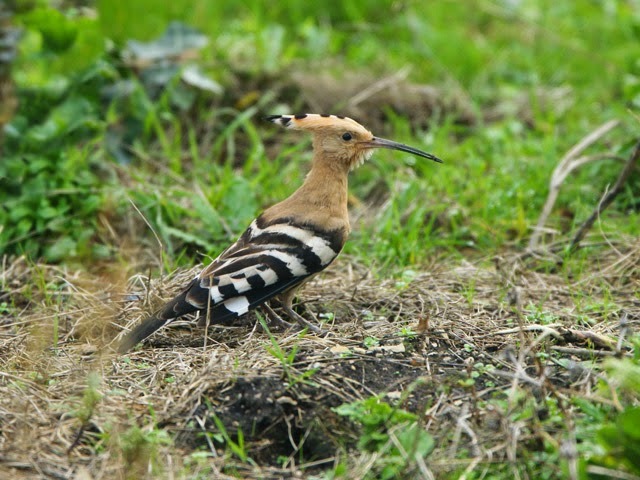 Rain and a northerly breeze were trying conditions for the few birders in the field but were just right for dropping another succession of new arrivals; however, the chief surprise of the day wasn't actually a newcomer but the reappearance of the very mobile and flighty Hoopoe in Weston Street/Coombefield Quarry area. 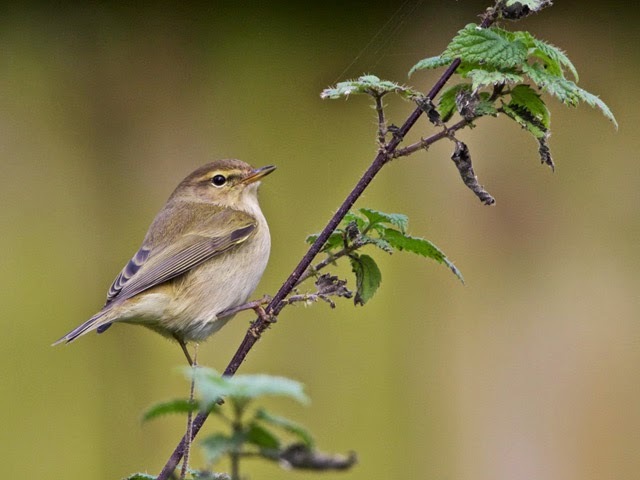 The newcomers were mainly thrushes, with 50 Blackbirds, 40 each of Redwing and Song Thrush, and 13 Fieldfares at the Bill alone; Chaffinches were also trickling through at a similar rate, 2 Blackcaps at Southwell and a Golden Plover over Watery Lane were of note, whilst ringing efforts revealed new singles of Chiffchaff and Goldcrest to add to the mix at the Obs. 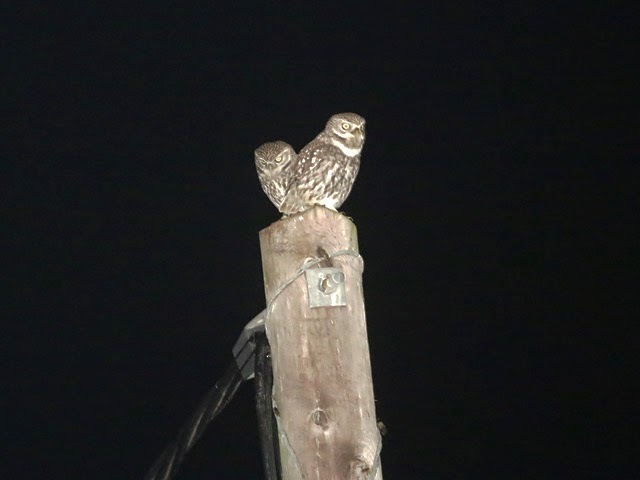 Other reports were the land were more likely to refer to lingerers, with at least 10 Black Redstarts scattered about, 3 Short-eared Owls still at the Bill and a Great Spotted Woodpecker again at Southwell. 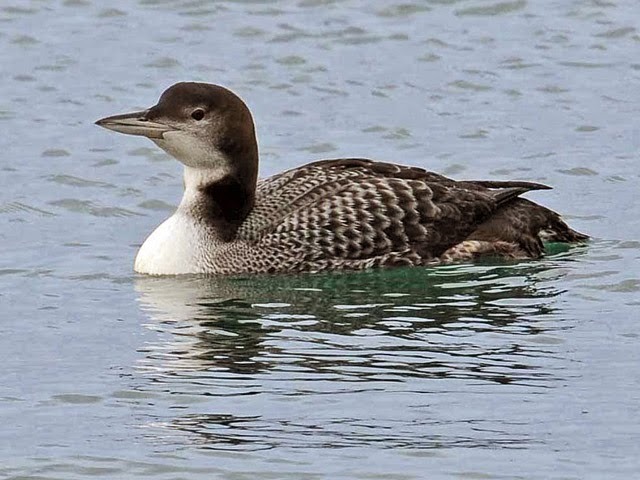 Sea news concerned 8 Great Northern Divers, 7 Shelduck, 5 Black-necked Grebes and 2 Common Scoter in Portland Harbour and 8 Red-throated Divers through off the Bill. In conditions that didn't look at all promising there was surprise increase in immigrant moth variety/numbers, including 7 Rusty-dot Pearl, 2 Diamond-back Moth and singles of Dark Sword Grass, Pearly Underwing and Silver Y caught overnight at the Obs. Another nice selection of late arrivals today, with Black Redstarts in particular featuring much more conspicuously than would expected in mid-November. The Dusky Warbler lingered on for another day and continued to provide the best of the rarity interest, whilst it was the 20 or so Black Redstarts - including 8 at both the Bill and Portland Castle - and the general spread of thrushes - including 50 Blackbirds, 34 Redwings and 18 Fieldfares at the Bill - that provided the bulk of the numbers of more routine fare. 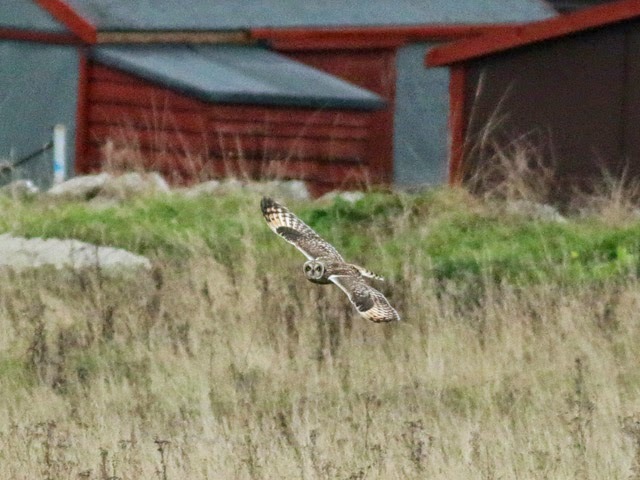 Other noteworthy migrants included 4 Short-eared Owls, 2 Bramblings and a Wheatear at the Bill, a Short-eared Owl at Barleycrates Lane, single Great Spotted Woodpeckers at Southwell and Easton and 12 Chiffchaffs and another Wheatear at Portland Castle. Reports from the sea included 13 Brent Geese, 9 Common Scoter and a Red-throated Diver through off the Bill and 4 Great Northern Divers, 4 Black-necked Grebes and 2 Common Scoter in Portland Harbour. The odd few immigrant moths linger on, with 3 Rusty-dot Pearl and a Silver Y caught overnight at the Obs. 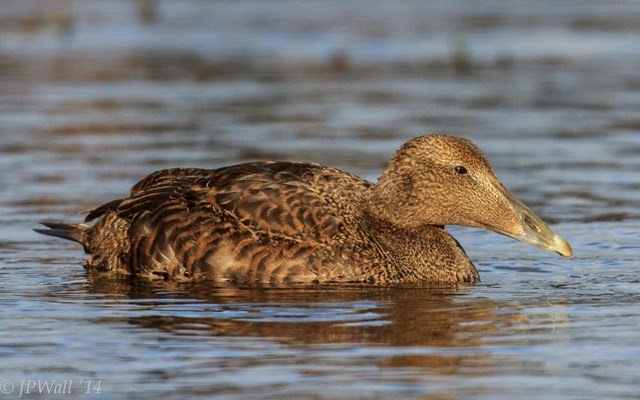 Finally, for a different take on events around the island don't forget to check out Sean Foote's always entertaining blog, The Portland Naturalist.